← Nickelodeon Gak is Gak! I am so jealous of my cat. I don’t know anyone who wouldn’t be…my cat has the best seat in the house! My cat now has Sunny Seat Cat Window Bed As Seen on TV. I used to think my cat was lazy before we got Sunny Seat, but now I can honestly say all she does is lounge around in the sun, soaking it in with a look of utter contentment and satisfaction as if she has just won a prize. To her, I suppose she has. 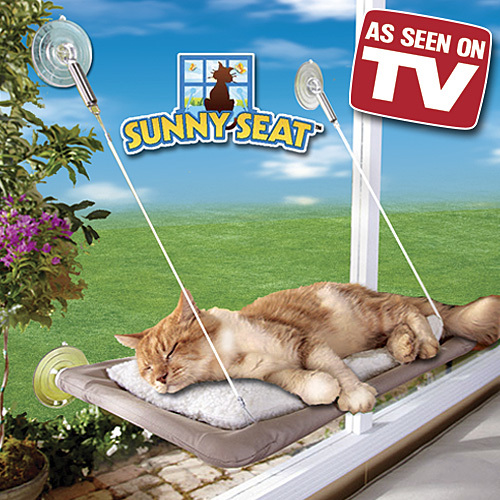 Sunny Seat As Seen on TV is the revolutionary cat bed that suctions to the window so your cat can relax and absorbed the sun, just like they’ve always wanted.